Back in May we were offered a free “blogger” tasting dinner at Shilla, to try out their new dinner menu. Instead of keeping for ourselves (which would be wrong), we gave it away to you guys in a contest. The lucky winner was Lunch’er “Olivia”, and today she sent us a report. It’s dinner, not lunch, and obviously the food was free (free always tastes better, right?) But we figured we’d post it anyway. First, because she took the time to do it. And second, to show that it really does pay to read Midtown Lunch! Thanks to Midtownlunch’s May 18th contest, I am able to bring to you my first ever food review. 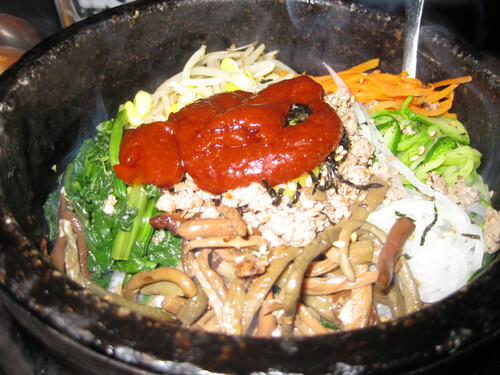 Shilla Korean Barbecue House is located in the middle of K-Town, otherwise known as 32nd Street. The restaurant has three floors, and we were invited to eat on the third floor. 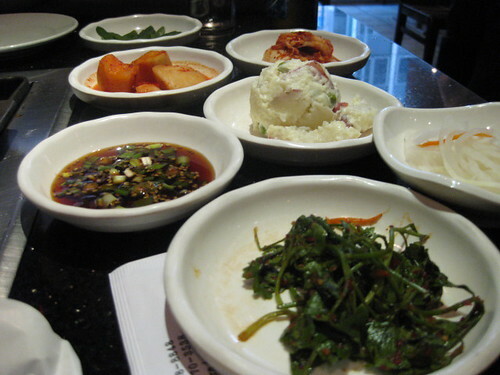 We started off with the complimentary side dishes typically served in a Korean BBQ Restaurant – Kim Chee, Potato Salad, Egg food omelette, etc. 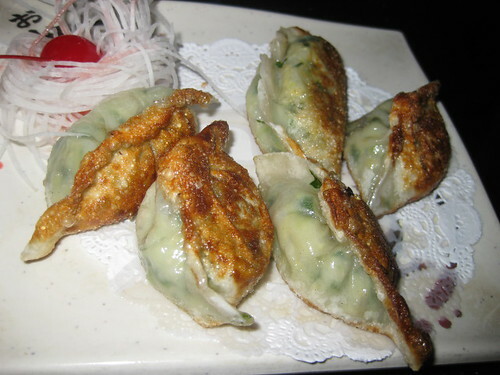 Our first appetizer was a seafood scallion pancake or HaeMool PaJon ((S) $10.95). The seafood scallion pancake here was one of the better pancakes I’ve eaten at a Korean restaurant and especially enjoyed its chewy texture. We were also served vegetable dumplings, which were good but nothing memorable. 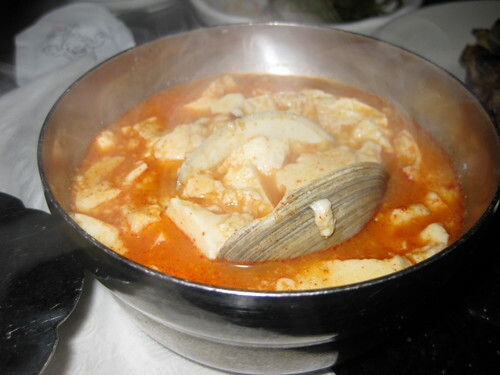 Our first entrée was Soon Tofu Jjigae (Spicy soft tofu stew with seafood) – solid, but again nothing special. Next came the Bi Bim Bap (Mixed vegetables over rice w/ beef & egg). I would probably pass on this particular dish if I were to eat here again. It was not terrible, but it tasted as if it was lacking a key flavor or ingredient. The entrée that was most memorable was the Kalbi (Marinated Short Ribs). The well seasoned short ribs were cooked on the table in front of you and served with Korean bbq sauce, rice and lettuce upon request. You can either eat the tender and flavorful Kalbi by itself or wrapped with rice in lettuce. We were not offered any dessert, though to be honest, I’ve never had dessert at a Korean restaurant before. Maybe Korean restaurants do not serve dessert ? All in all, Shilla is a solid place. The service was excellent (though we were invited by Shilla thru midtownlunch.com, so …) and dinner prices seemed quite standard. Most of the food was good, but nothing memorable. 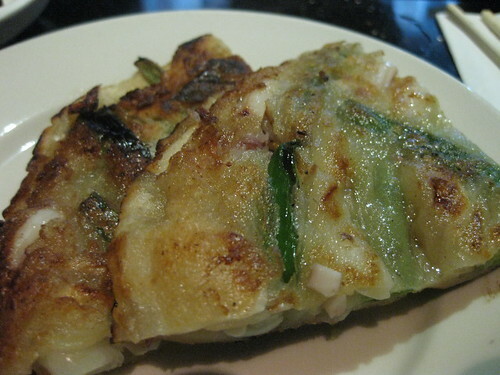 If I were to return to Shilla, I would definitely stick to ordering the seafood scallion pancake and the Kalbi. Posted by Zach Brooks at 10:30 am, August 5th, 2010 under Shilla. I’ve eaten there three times now. I never get anything but the BBQ because like you said, everything else is forgettable. 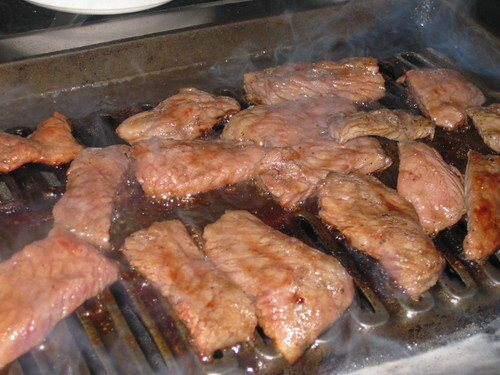 I’ve tried friend’s dishes and always returned to the grilled meats.